With years of experience and knowledge in this domain, we are engaged in offering an excellent range of Winding Unwinding Machine for Pharma Industry. Provided machine is manufactured using high grade components and advanced technology by our proficient professionals. The offered machine is tested on different quality measures in order to ensure its flawlessness. Used in medical sector, we offer this machine to our clients in different sizes and designs. Established in the year 2011, Shreeji Group Of Company. 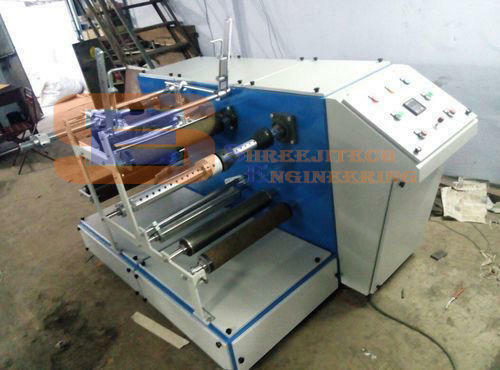 is considered as the pioneering Manufacturer and Supplier firm of exceptional quality Rewinder Machine. Our innovative abilities to implement cutting edge production technology furnishes us to bring forward a broad assortment of much-anticipated products, which incorporates best in class Doctoring Rewinder Machine, Rotogravure Printing Machine and Label Slitter Rewinder Machine. We attempt to adhere to the leading manufacturing standards to produce excellent quality tools highlighting unmatched levels of removing the miss-registered materials and correcting the rollers, hardness uniformity, and high durability. Moreover, our company dealings are mounting to the distinct heights, as our workforce is qualified to render acknowledged customization services at a competitive price. We are involved in examining the new limits of innovation in our stock design, which is why our results are broadly appreciated in diverse manufacturing terrains, comprising printing units. We put special applications to leverage the cutting edge technology at our production base, where we attempt to meet the company goals of our esteemed customers. Owing to our operational perfection and unmatched quality production, we have become an ally of choice for leading entities.